Jordan’s King Abdullah and the foreign ministers of France and Iran made separate visits today to Iraq, an ally of Tehran, amid U.S. attempts to rally allies against the Islamic Republic as Washington starts withdrawing troops from neighboring Syria. King Abdullah’s visit, his first since 2008, follows a week after U.S. Secretary of State Mike Pompeo stopped off in both countries at the start of a Middle East tour meant to mobilize Arab countries against Iran and reassure them over the planned U.S. troop withdrawal from Syria. 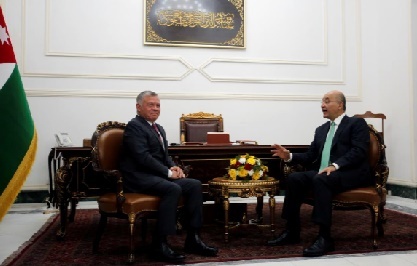 The Jordanian king was greeted by President Barham Salih on a red carpet at Baghdad airport before heading to meet Prime Minister Adel Abdul Mahdi. Salih welcomed the visit as strengthening “joint interests and security”. Pompeo, who was in Riyadh on Monday, promoted a planned Middle East Strategic Alliance (MESA) that would include Gulf Arab states, Jordan and Egypt. Washington is seeking to weaken Shi’ite Muslim Iran, Israel’s arch-foe in the region, with renewed sanctions and the support of Sunni Arab allies. In Iraq, Washington has made overtures to officials with vague pledges of greater economic cooperation and has pressured Baghdad to stop importing Iranian gas. But the planned withdrawal from Syria of 2,000 U.S. troops, announced by President Donald Trump last month, alarmed U.S. allies across the region, including Israel, which worries that the move could embolden Iran. Pompeo’s tour came weeks after the announcement, and after a surprise trip by Trump to a U.S. military base in Iraq that included no meetings Iraqi leaders, prompting criticism from politicians.